Navodaya 9th class Entrance Test Results 2019 JNVS IX Class Admission Test Selection List navodaya.gov.in www.nvsadmissionclassnine.in : RESULT FOR LATERAL ENTRY ADMISSION TO CLASS IX ( 2019-20) AGAINST VACANT SEATS : JNVS Navodaya 9th Class Lateral Entry Test 2019 Results, Navodaya IX Class Entrance Test 2019 Results, NVS 9th Class Entrance Test 2019 Results, Results of Navodaya Vidyalaya Samiti Entrance Test 2019 for 9th Class admissions, JNVS 9th class Admissions 2019-20. Navodaya 9th Class Lateral Entry Test 2019 for admission into JNVs during the Academic Year 2019-2020 NVS Hyderabad region issued the Navodaya Vidyalaya Samiti Entrance Test 2019 Notification in the month of October . Jawahar Navodaya Vidyalaya Samiti Hyderabad Region invited the applications from the eligible students for admission to Class IX of Jawahar Navodaya Vidyalayas of the District, against the vacant seats, which are likely to be available during the academic year 2019-2020. The admission is through an All India Test held on 02-02-2019 at 10.00 hrs. 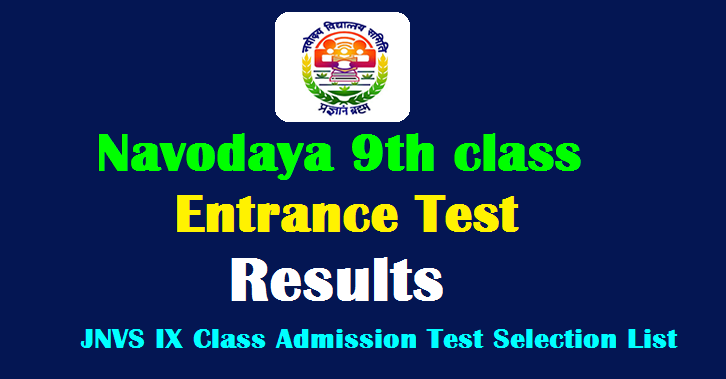 Navodaya 9th class Entrance Test Results 2019 JNVS IX Class Admission Test Results released on 28-03-2019 Intimation given to Selected Students on 29-03-2019 rresults and required documents are available here. Jawahar Navodaya Vidyalaya has announced the Navodaya Vidyalaya 9th Class Entrance Exam Result 2019 (JNVST 2019) on its official website. The JNVST 2019 is conducted by the Navodaya Vidyalaya Samiti to take admission in Class IX in Jawahar Navodaya Schools in India. All the candidates who appeared for the JNVST can visit the official website of the Vidyalaya to check and download the the entrance exam result. The JNVST 2019 examination was conducted on February 2, 2019, from 10.00 Am to 12.30 PM. It was held in a Written Objective Type for a total of 100 Marks. The results of JNVST 2019 will also be made available at the offices of the concerned- (i) Jawahar Navodaya Vidyalaya (ii) District Education Officer (iii) District Magistrate (iv) Deputy Commissioner, Navodaya Vidyalaya Samiti of the Region. 3. Certificates from the competent authority in respect of Rural, OBC, SC, ST and Disability as applicable are to be submitted to the JNV for verification of documents / eligibility to confirm admission to Class IX /9th class After verification, JNVs will confirm the admission, if the candidate is found eligible as per NVS norms. It is informed that admission will be given to the selected candidates only after due verification of the documents. Parents are advised not to take TC from the previous school until the admission is confirmed by the JNV. Admission to JNVs is done free of cost. No fee is to be paid to school authority for admission to Class- IX /9th class. The parents/students are required to approach directly the Principal of the JNV concerned.